Payton and I took the sidecar to breakfast in town. It was rain like heck so no pictures. She likes the new one. Quieter and rides better she said . She likes the seat also. I believe that is the best looking set up I have ever seen...all the best to you and Payton. Thank you, this has been about a 9 month process 5 in making sure we wanted to do it and planning what we wanted to do and 4 getting it done. Lot of input from others helped guide the process. HD shop manager, the tech. The people at Hannigan and others on the forum. Pro's and cons of different approaches. Right from the start the negative was placed to the side for the most part once over ruled by people that knew what they were doing. Once we made the call it was not a madder if it would work but a madder of getting it done right. It has been an education and a worth while journey . We did ok on the budget. The changes I made to the paint and filling the shell seam add cost. Adding the Spoiler on the rear with light. Buried in the cost was also two new tires, new brake pads front and rear. Adding ride on in all 3 tires and 90 degree value Stems , a full bake system flush. The number hand my wife was $14,652. She was happy with it. I paid the last bill on the job yesterday when it was picked up. A thank you of $100 for the shop manager and $100 for the tech was not include in the cost. They earned it in what they saved me by doing things right. Last edited by smitty901; 10-05-2018 at 04:12 PM. Grandson came over last night after Soccer game. We went for a night time ride. He had to check it out. Today Payton is going spend time with her other Grandmother. 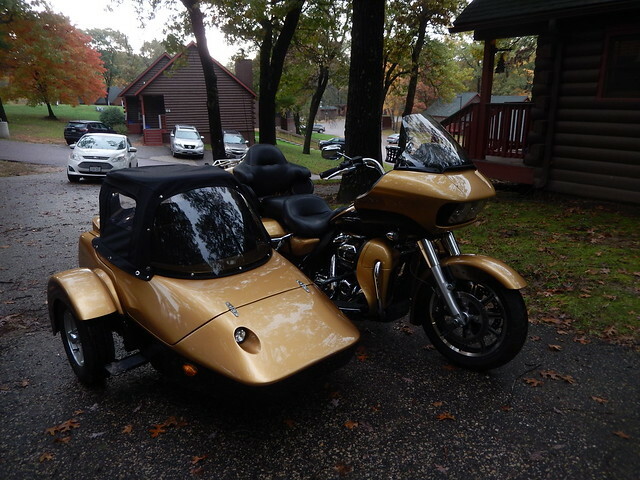 After a few things I need to do around the house like install new dryer I am going out to play with the sidecar between rain storms. The ride in the dark was cool. That small forward white light really puts out some light. Yesterday morning left out about 2 hours before sun up. A ride to WI Dells. Mother in law and Wife are there for the week. MIL forgot some of her Med's so I ran them to her. was lucky and dodged the rain for the 135 mile round trip. It was a cool 47-51 degree ride. Going back tonight of early tomorrow , taking Payton there and picking her up late Thursday. My plan now is to then go there with the sidecar and ride the area. I have to take the Van to get here there for now. She will need her normal Wheel chair. The sidecar tire limits me to 118 MPH constant speed. Ok that aint happening anyway. Today ran it up to 90 on a less than prefect state road no issues. Road it 80-85 cruise for a while no issues. When you get to 85-90 you start to notice a bit of drag on the HP. when going up a grade. Rode in to Madison today. Purchased a wheel chair . Now Modifying to fit in the sidecar. The foot rest are not for this chair. Just finished re-engineering Them to work. The wheels are not quick release yet but I think it is something I can do. A few more mods and it will fit taken a part some. Dog is helping. My plan latter is to replace foot rest will foot rest from a motorcycle. 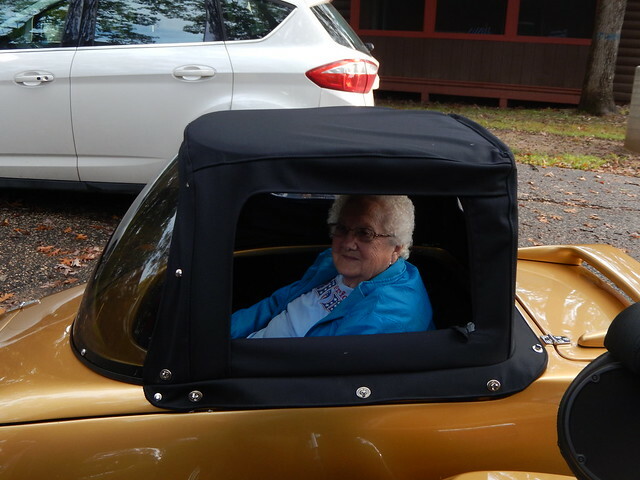 At the Dells this week grandma 87 years old went for a good ride . Never to old to Smile !!!!! !